Uma casa familiar de férias para alojamento local, localizada no pacato centro do campanário, próximo à igreja! Uma casa rural de dois pisos com horta de ervas aromáticas, quintal, varandas equipadas com espreguiçadeiras e mesa de chá, composta por sala comum (Televisão ecrã plano por cabo e acesso Wi-Fi gratuito), cozinha (placa e forno eléctrico, microondas, frigorífico, jarro eléctrico, varinha mágica, cafeteira e tostadeira), três quartos de dormir com alojamento para oito pessoas [Quarto nº1 com uma cama de casal (King Size), com opção de Berço para criança, incluído, Quarto nº2 com uma cama de casal e uma cama individual, Quarto nº3 com uma cama de casal e uma individual) e duas casas de banho. Servida de padaria, supermercado, restaurante, farmácia, centro de saúde e praça de táxis a 100 metros! Transportes públicos da "Rodoeste" para o norte da ilha até ao Arco de São Jorge e para o lado sul até ao Funchal. Está situada a 15 minutos do Funchal e a 25 minutos do aeroporto pela via rápida. A 15 minutos do "Cabo Girão" pela estrada regional. Acesso pedonal de 25 minutos ao Calhau da Lapa. Casa típica, regional, com dois pisos, logradouro no R/Chão e quintal no 1º piso. Construída em 1937, restaurada e remodelada em 2014. Sanita, Chuveiro, Base de duche, sanita e lavatório com móvel e espelho. This was our first visit to Madera. We spent a month at the house,December thro January.The weather was perfect .Warm during the day and just a little cool in the evening. The owners were most helpful and anxious to please.Alhough a can is not essential ,if you wish h to see the inner parts of the island, af car is well worth hiring.We shall most certainly return to this most beautiful house. Nous avons séjourné ma femme et moi, à ce gîte du 15 au 28 octobre 2018. L'acceuil de Maria Teresa et de Isabel est tout simplement charmant. L'endroit est inpeccable, propreté des lieux, accessoires disponibles pour la cuisine. La localisation est parfaite pour visiter Madère, près des grandes routes. La boulangerie à quelques mêtres du gîte cuisine d'énormes croissants, de bons pains et petites pizza tout à fait délicieux. L'épicerie à côté offre toutes les denrées nécessaires pour nous dépanner. La vue sur la mer et la montagne est magnifique. L'endroit est très tranquille. Bien entendu les cloches de l'église jouent de la musique mais pas la nuit. alors repos assuré. Wir waren 11 Tage im Oktober in dieser gut gelegenen Unterkunft in Campanario. Die Wohnung ist gut ausgestattet und bietet viel Platz. Sehr gut gefallen hat uns die unaufdringliche, aber sehr liebevolle Betreuung durch Maria und das Cafe auf der gegenüberliegenden Straßenseite ausgezeichnentem Kaffee und Backwaren. Auch der kleine Supermarkt bot alles für den täglichen Bedarf. Wir können die Unterkunft rundum empfehlen. Thank You very much for your complements , hope to see you back in Madeira soon . Wir haben im September zu zweit 2 Wochen in dem schönen Häuschen von Maria verbracht und uns sehr wohl gefühlt. Es war alles sehr sauber und zu zweit reichen die unteren Räume voll und ganz aus. Sehr schön ist auch die große Terrasse, die wir dank des guten Wetters auch hauptsächlich genutzt haben. Maria ist eine sehr liebenswerte, unaufdringliche Vermieterin, die uns immer mal wieder frisches, leckeres Obst vorbeigebracht hat. Auf der gegenüberliegenden Straßenseite gibt es eine geniale Bäckerei und auch einen kleinen Supermarkt, um sich mit allem zu versorgen. Campanario ist ein kleiner Ort ohne Hotels, was wir als sehr angenehm empfunden haben. Es gibt mehrere kleine Snackbars und ein gutes Restaurant ein paar Meter den Berg hoch. Campanario ist ein guter Ausgangspunkt, um die Insel zu erkunden. Ein Auto ist auf Madeira unbedingt empfehlenswert. We were warmly greeted with a glass of Madeira wine and a local passion fruit drink for our boy. The host was a very warm and kind lady, who occasionally left us a basket of fruit and made us a lovely cake! The property was easy to find and well located opposite a small supermarket and cafe and close to the main tunnel roads. The home was clean to a high standard and the kitchen was well equipped. We would happily go back to the same place. The villa was exactly as advertised and was immaculate inside and out. Spotlessly clean and everything you could need to be at home. Well laid out and with plenty of room for everyone. In all, everything looked as brand new, and we couldn't find anything to fault. We were met on arrival by the owner who is a charming lady, with a welcoming glass of Madeira wine, who showed us around the property and where everything was. There are two restaurants a short distance up the valley which we heartily recommend. To make the most of your visit a car is essential. Driving around the Island is easy and gets you to all the places that organised tours don't touch - very much worth the effort. 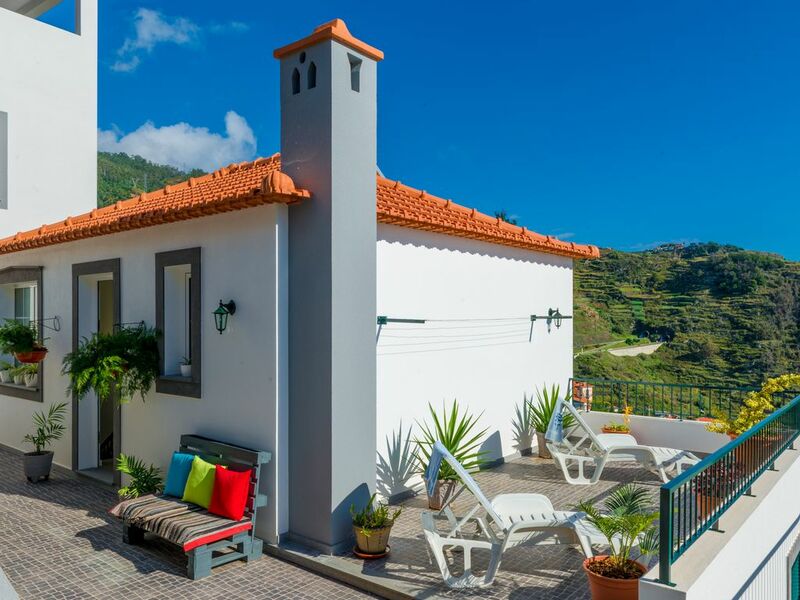 We would have no hesitation about using the villa again on our next visit to Madeira. Thank you very much for your comments , they are very much appreciated . Casa familiar, situada na localidade do Campanário, próxima de diversas atracções emblemáticas, tais como, o Cabo Girão (5 minutos de carro), caminhada à praia do "Calhau da Lapa" (5 minutos de carro, 20 minutos a pé), Caminhada à "Levada do Norte" [Quinta Grande à Ribeira Brava, (5 minutos de Carro 2 - 4 horas a pé)], Praia da Ribeira Brava (7 minutos de carro).